That sounds awesome Laura! I really like that you’re focusing on the stuff that’s a problem for YOU instead of just blindly following a program that might work for someone else. Can’t wait to hear how the rest of the month goes! I am so proud of you! SO SO SO proud! Haha yes true Maggie. It’s just a super weird craving for me, I never crave alcohol EVER… sugar/carb cravings usually manifest in the form of wanting brownies or some sort of sweet fruit pastry or muffin. The wine craving seems to have passed, and I’m still not craving sugary carbs very much. But I would probably do really inappropriate things for a plate of pasta and cheese right now. I like simple carbs too much for my own good… I have been enjoying quinoa and barley recently though so maybe there’s hope for me yet! I am sooo proud of you! 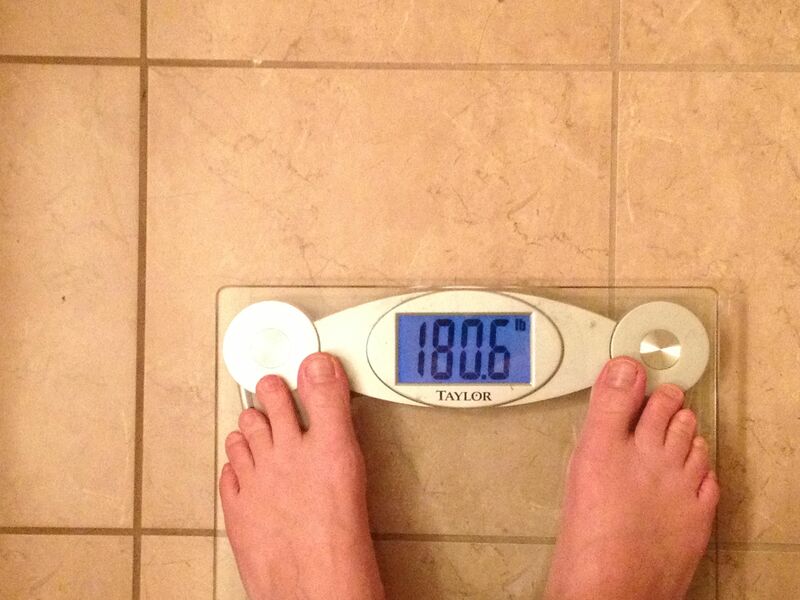 I love that you posted the scale. YOU CAN DO IT! I am doing something similar- I just started the eating clean lifestyle. So if we’re both still at it in May at BiSC, we’ll at least have each other! Awesome Caryn! I don’t expect I’ll be doing it as strictly on vacation but I am really hoping I can make healthy eating into a more consistent habit over the long term so the whole trip won’t be one long pizza and dessert fest! Nice to have a salad buddy to hang out with. I first heard about Whole 30 not long ago, and while it sounds like a great idea in theory (man, I’d love to reboot my system and feel better! ), it sounds… really hard. Like REALLY hard. And somewhat impractical. I like your version better. I get that they say if you have even one granule of sugar it ruins the whole thing, but I’m not sure I really believe in a “system reboot” honestly. At least not for me… I’m not low on energy, I’m not overly stressed, I get enough sleep, the only physical side effect I have from the way I usually eat is that I have trouble losing weight (which I should do) but that’s to be expected because, well duh. What I need is to break some habits and patterns, which is mental. I need to stop reaching for carbs + cheese as auto-pilot food and having a muffin or pastry as a normal snack. So I think, if you really think about what *you* want to accomplish rather than sticking within the parameters of a plan that’s already out there, you’ll come up with the plan that actually makes sense for you. And I also think that if you decided to do Whole 30 for a month, and you slipped up once or twice, then holy crap! You did 28 days of perfect clean eating! Probably a massive improvement, right?